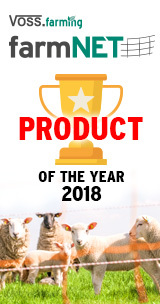 Sheep net, sheep fence, electrifiable nets of the highest quality - "Made in Germany"
Electric fences for sheep should be adapted to the special requirements of the livestock and should also reliably fulfil their protective purpose. An electric fence for sheep or alternatively sheep netting ensures that the animals are effectively enclosed. 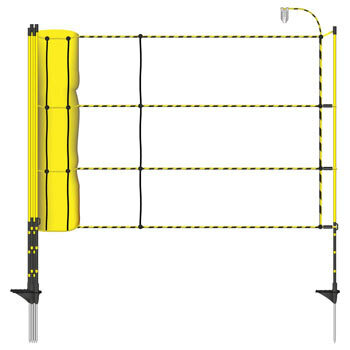 What is important in terms of safety for an electric sheep fence, and what should I particularly pay attention to? What type of electric netting for sheep and goats is available and for which circumstances? The answers to these questions are provided to allow you to make a well-informed decision when making your purchase rather than deciding at random. Why should I buy special fencing for sheep? Many people believe that an ordinary electric fence or even a normal wooden fence will be sufficient to protect sheep. However, this is a mistaken belief, as you should not decide which fence to buy without considering the animal for which you require the fence. Sheep are known for being especially stubborn and, similarly to other livestock, they have a desire for freedom or to break free. For this reason it is not uncommon for sheep to get the better of an insecure fence and escape from the field. In the most harmless cases, this means a lot of work as you will have to find and catch the sheep and repair the broken fence. However, in the worst case scenario, the animal may become injured, or get lost, get involved in an accident or be attacked by wild animals. Sometime it may be that an escaped sheep can no longer be found, or that it gets killed when out on its adventures. To avoid all these problems, an electric fence for sheep or sheep netting supplied with electricity would be a far better option. However, a standard electric fence is not always enough to keep your animals safe. Why is this? The answer is obvious: Sheep have a dense and thick woolly coat. This means that they have a higher tolerance to electric shocks than, for example, cows or horses. Sheep’s wool acts like an insulator against electricity and when the sheep touches the fence it does not or barely feels the electric impulse emitted by the fence. Therefore, a cattle or horse fence with their associated energisers would only be partially suitable for fencing in sheep. If the animal’s desire for freedom is particularly great, an electric fence for sheep will be required. This is equipped with an extra-powerful energiser for sheep so that the electric impulse acts as a sufficient deterrent. Sheep netting takes things another step further and is strongly recommended by experts wishing to safely protect sheep. Incidentally, an electric fence or electric netting is also available for goats. With their long, partially shaggy coat, goats are also naturally more resistant and tougher than other animals, and can only be deterred by an electric fence equipped with a high-performance energiser. If you wish to buy an electric fence for goats, it is useful to know how it operates, at least to a certain degree. This will help you understand why every little detail counts and what exactly you need to make decisions about. How does an electric fence for sheep and goats work? The central element of any electric fence system is the energiser. It is connected to the power supply or powered by batteries or a battery unit. Electricity of a certain voltage is transmitted from the energiser to the conducting material which, in the case of electric fences for sheep, is also extremely important. 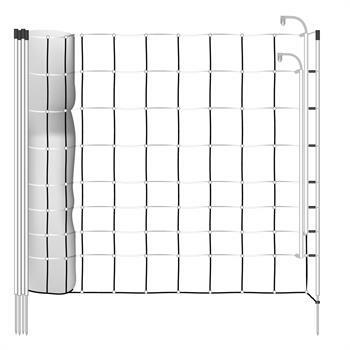 The fence system is provided with an optimum energy supply when the energiser voltage is high and resistance as low as possible. The same applies to electric netting. The discharging power on the energiser should be 2.5 joules or more so that the shock is sufficiently strong when the fence system is contacted and the electric circuit temporarily closes. A power supply of at least 2,000 V is recommended. In principle, it is preferable to supply the fence with electricity from a mains power supply, and it is always best to supply too much, rather than too little, electrical energy. We recommend a 12 V sheep fence energiser. This type of battery set or battery unit with high impulse energy offers an advantage especially for electric fence nets which contains steel conducting wires. It ensures stability, however the disadvantage compared to fences with polywire or tape and copper wire is that electricity is not conducted as effectively. The longer the sheep fence or sheep netting and the denser the vegetation on the land to be enclosed, the more powerful the energiser needs to be. Anyone wishing to make use of alternative energy can also add solar panels to the battery unit. In this way, energy from the sun can be utilised to enable environmentally-friendly operation of the electric fence for sheep. Remember to take the conductor into account in your calculations. On electric fences for sheep and goats, the conducting material generally consists of electric fence tape or polywire made of stainless steel alloys. The energiser transmits electrical energy which flows through the conducting material. When the fence is touched by an animal, this contact releases an impulse. The longer the fence, the better the conducting material needs to be, as the voltage becomes weaker with every few metres. This is another reason why sheep netting offers a better alternative. Instead of having to stretch out three to four rows of polywire over a certain distance and using various conductors with insulators and connectors to enclose large areas, if you use sheep netting, everything is included in one go. Electric sheep nets are equipped with integrated conductors and built-in stakes and posts. What else characterises electric sheep nets? The latter aspect is further reinforced by sheep netting available from our online shop, as narrower mesh is used in the lower part of the netting. Regardless of how small and adventurous a lamb may be, it will not be able to get through the netting as it will inevitably come into contact with the conducting material and receive a short, sharp shock. Therefore, narrow mesh sheep netting is the right choice for anyone wishing to protect lambs. Here, the mesh distance of 9 cm is ideal, whereby vertical distances may otherwise be 13 or 15 cm. The horizontal distance is often 17.5 cm. Other designs include distances of 10 cm and 15 cm. 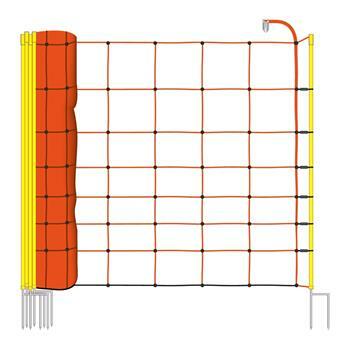 One type of sheep netting is never the same as another where details are concerned, as different types are available for different situations. Thus, for example, 25 m sheep netting exists which is generally sufficient for protecting a small to medium herd. Those looking for longer electric netting for sheep or goats should also be able to find what they need, or you can easily combine several nets. The standard net height is 90 cm. If you wish to make provisions for emergencies, 112 cm-long green sheep netting at a height of over one metre should suffice. The green colour allows the sheep net to blend seamlessly into the surroundings. On the other hand, if you would like the animals to clearly see the netting or for it to be visible from a distance, sheep nets are also available in bright colours such as orange or yellow. The original Euro-Net, made in Germany, is one of the classic types available in our online shop. The UV-stabilised Euro-Net, which corresponds to safety standards, ensures a protective enclosure. Another plus point of which many are not aware: In the same way that it is unlikely that livestock will be able to escape from the enclosed area, it is also unlikely that wild animals will be able to get into the enclosed area from the outside. This eliminates the risk of attacks, injuries, contamination and stealing of feedstuff. The electric fence netting for sheep does not just include the net itself although this is, of course, the crucial component. Stainless steel conductors are built into the net at a vertical distance to the conductive polywire. A ground wire is attached to the lower part of the net. This stands out from the other wires, not only in terms of colour, but also in that it does not conduct electricity. The same applies to the vertical wires which complete the meshed network. 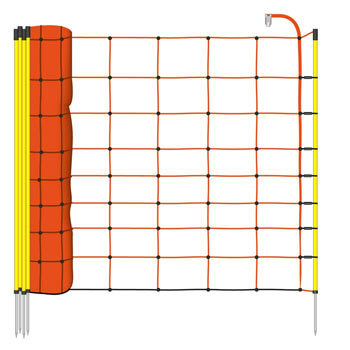 In general, the points of intersection in the grid mesh are reinforced to provide a tough and hard-wearing structure. High-quality products feature, for example, a plastic seal which has been welded in an undetachable manner onto each mesh cross-point. So there’s no need to worry about the net tearing easily. 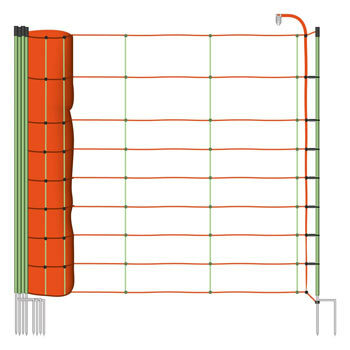 The number of rows of horizontal conductors depends on the height of the net. At a height of 90 cm, nine polywires are arranged vertically, whereby the ninth wire does not conduct electricity. In addition to the polywire and conductors, end-bearing posts are also built into the sheep netting. Thanks to them, assembly and disassembly is child’s play, which is one of the main reasons why mobile electric netting is so popular. 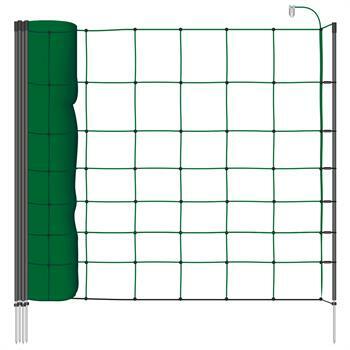 A 50 m-long sheep net is equipped with 14 plastic posts. Why plastic? Because, unlike metal or wood, plastic posts are weather-resistant, tough and durable while, at the same time, remaining flexible. The sturdy net posts have been treated so that they resist the rain, cold, sunshine / UV rays and heat, which makes them an excellent choice for equipping goat nets in the long term. A repair set is included in the scope of delivery of branded products so that you can repair the net in an emergency. You can also use Kerbl wire clips for this. The set also comes equipped with a head insulator and ground stopper to attach the polywire to the post. Fixing tape and metal clips facilitate connection and assembly. The energiser is either already included or, as in most cases, must be purchased in addition. The electric fence net’s accessories also include a fence tester or an grounding post for grounding. Replacement posts with one or two tips, pegs for electric netting and a practical door for sheep nets can all be ordered online. How is the sheep net assembled? After unpacking it, the customer unties the fixing tape and unrolls the net, holding the plastic posts in both hands. The net should be placed flat on the ground so that you can hold it by the posts. Move away from the net while laying the posts next to each other on the ground to quickly and easily unfold the sheep netting. Then arrange the net in the required position. This may be in a circular or oval shape, or else following the rectangular or square shape of the sheep field. The fencing does not have to be circular. Then install each post firmly in the ground, one by one. A hammer is not required but the tip of the plastic post must be implanted deeply into the ground so that it does not wobble. If you require a circular shape, the start and end posts can be tied together with fixing tape and two clips. Finally mount the energiser. Ideally, the energiser should be mounted on the metal clip, but this does not have to be the case. 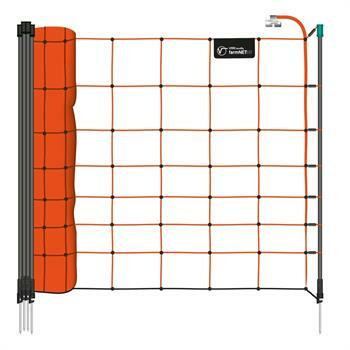 In theory, the fence connector cable can be attached to any point on the electric sheep netting. The top polywire is designed for this purpose. The energiser must then be connected to the source of electricity unless it is powered by a battery unit / battery set. Unroll – assemble – electrify – you’re done. Unbeatable, functional fencing for sheep, goats and pigs can be achieved with very little effort. The sheep netting is ready for use in just a few minutes. And it’s just as quick and easy to disassemble. As a professional manufacturer of electric fences, we also suggest: That, if your animals have horns, you only use the net in its electrified state. A fence which provides a mechanical barrier only is not suitable for protecting horned animals. If you wish to keep sheep without any fuss, then buy one of our electric fences for sheep. It comes equipped with high-quality conductors, a powerful energiser and highly resistant material. 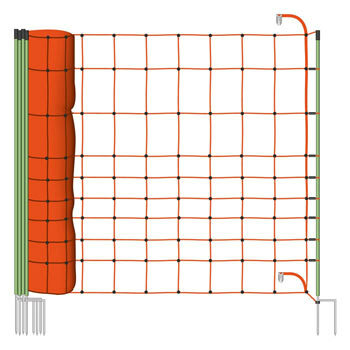 Electric sheep netting is even more suitable as it combines a mechanical barrier made from reinforced grid mesh with conductive horizontal polywire. Electric netting for sheep can be assembled and set into operation in just a few movements of the hand. 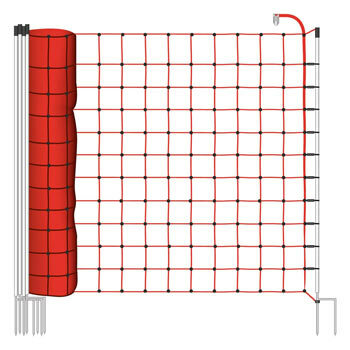 Unlike sheep fences, sheep nets are also portable and provide safety even in large areas. High-quality sheep nets prevent animals from escaping and effectively keeps out wild animals.